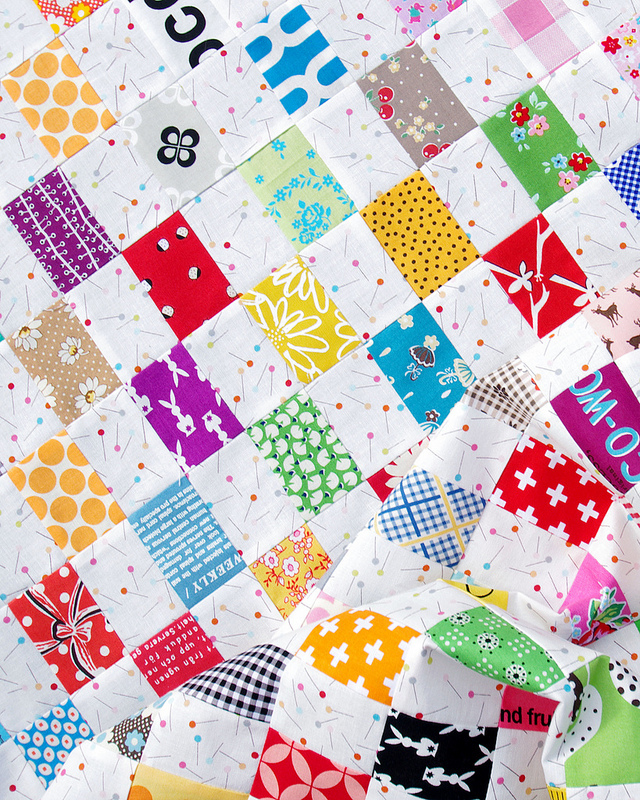 It is no secret that I love simple patchwork, especially Postage Stamp and Checkerboard Quilts; scrap quilts with lots of small pieces! 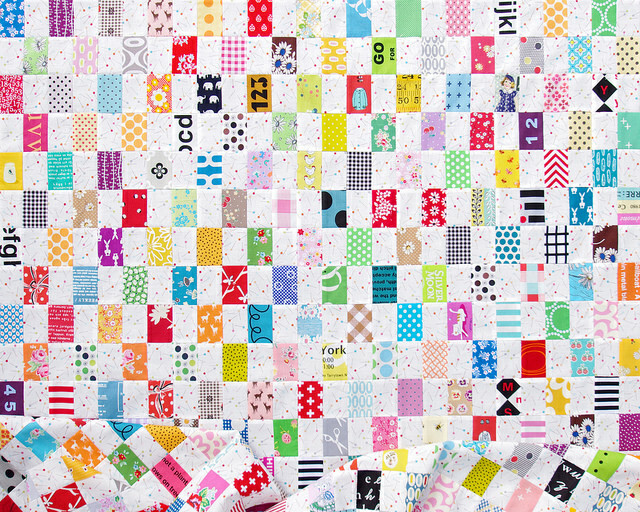 Although I am not sure what technically qualifies as a Postage Stamp Quilt I have looked at many great Postage Stamp Quilts with the thought that most postage stamps - the kind that are adhered to envelopes - are generally not squares but rectangles. And that's where this week's project started. As is often the case with my "scrap quilts" the fabrics used are pulled both from my scrap bin as well as from stash. To achieve sufficient contrast with the background fabric I have chosen fabrics that are dark and saturated in color. It seems that I have many fabrics in my stash that are light in color, or feature a color/design on a white background (or vice versa), so my search for fabrics without too much white contrast was more of a task than I had anticipated. 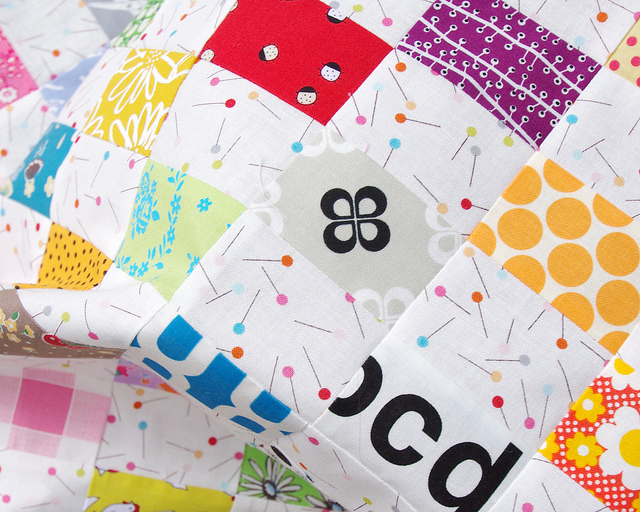 Many of the fabrics used are Japanese import prints but there are also numerous stash basics - dots, gingham, stripes - as well as text fabrics. The background fabric is a hoarded and much loved pin fabric from the Sew Stitchy collection by Aneela Hoey for Moda Fabrics released way back in 2012. I remember the excitement that this collection created like it was yesterday - how time flies! I purchased yardage of this particular print for backing fabric but I wasn't ready to let it go until the right quilt came along. And then this happened. 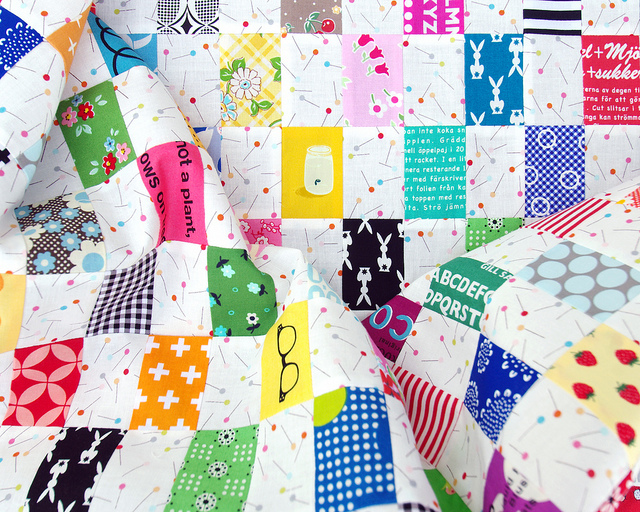 I think it is just the right feature fabric for this quilt. 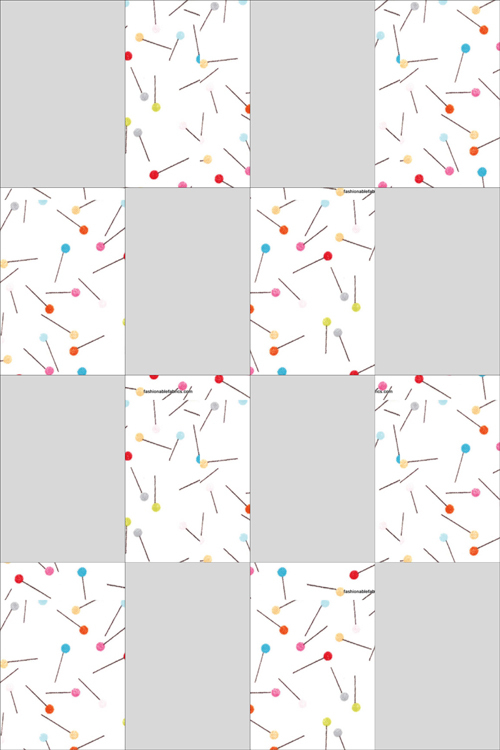 It is a fun print with a sprinkling of color that is happy to recede into the background when mixed with other prints. a total of 1080 patches of fabric. 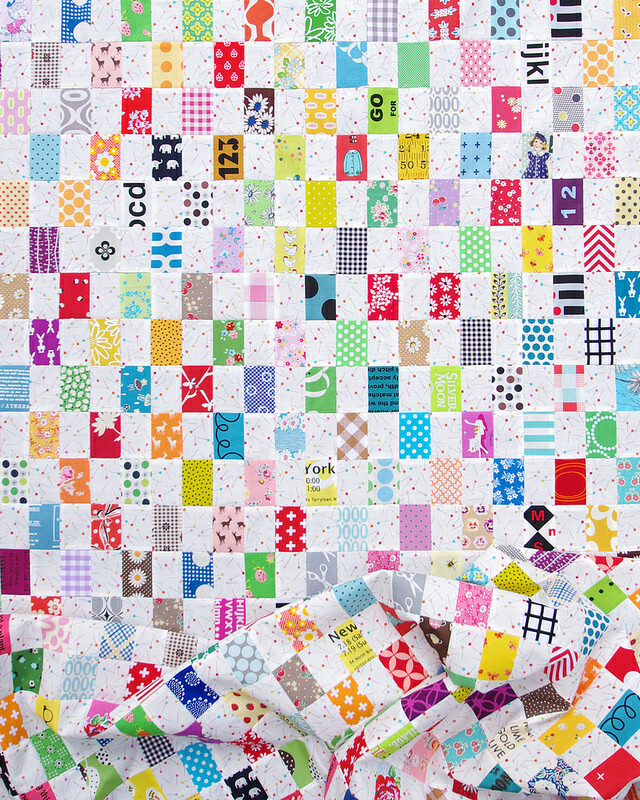 Each 16-patch block measures 6.5 inches x 9.5 inches. Each finished rectangle measures 1.5 inches x 2.25 inches. Quilt top measures 54.5 inches x 68 inches. 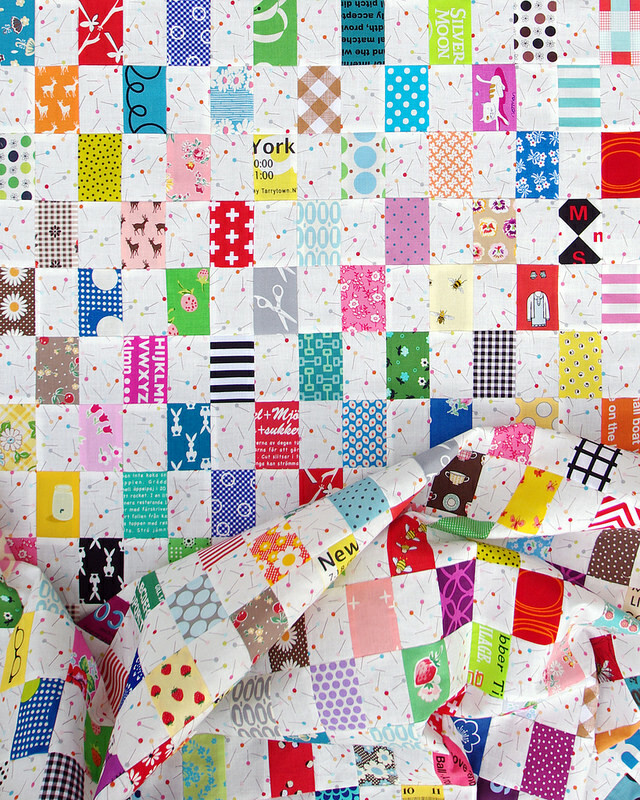 The fabrics that have been fussy cut - any fabric featuring a character, animal, or novelty etc. - have been individually cut and sewn together into a rows of four rectangles that have then been incorporated into a 16-patch block. 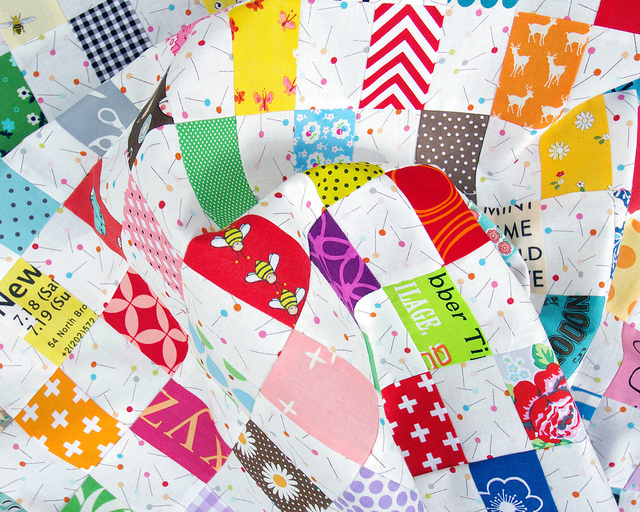 This adds to the overall random look of fabric placement which may not otherwise result from strip pieced blocks. 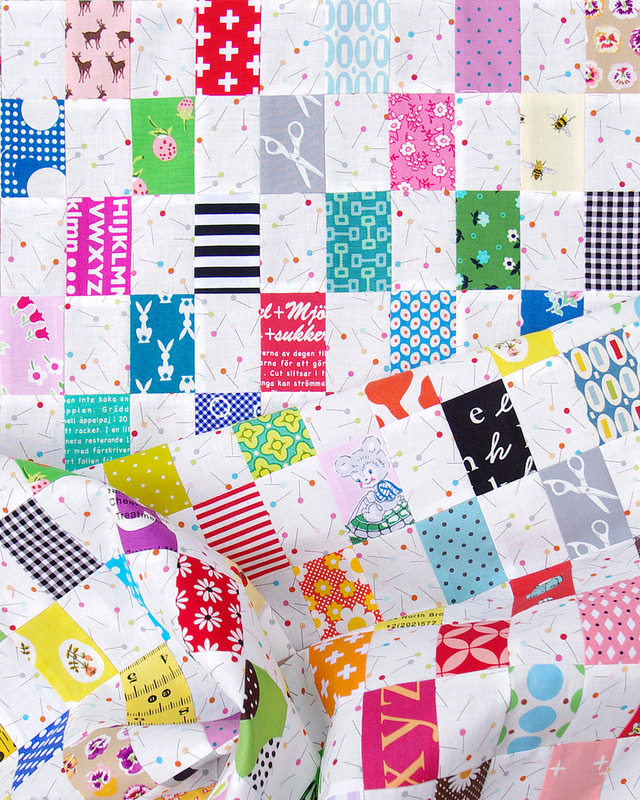 I really love scrappy looking quilts, but the unity that single background fabric brings help this be both lively and restful at the same time. Another beauty for sure. 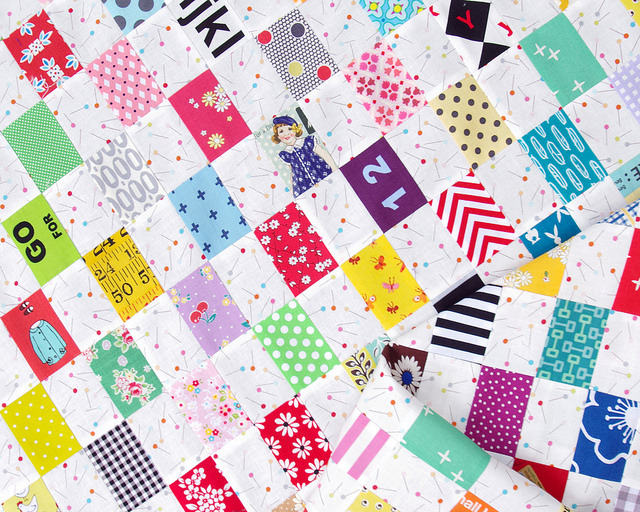 In the USA, most postage stamps ARE squares, so I guess that is why it is traditionally a small squares quilt. I knew this was going to be good. It is sooooo good. That is indeed the perfect background fabric. I can't believe it has been four years since its release! Love the background fabric and that daisy print with the brown background...too cute. I thought you were making a postcard quilt at first but with quilting there seems to be at least several names for one block. Just depends on the country, year etc. Lovely quilt for sure. Wonderful. I am going to start pulling fabrics soon! 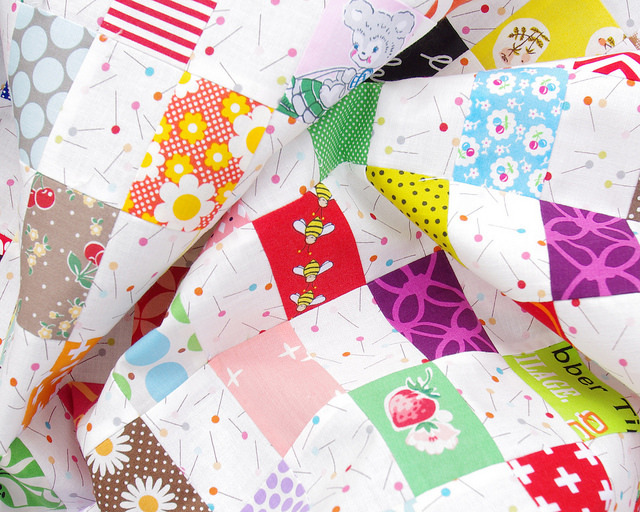 Rita, you have the cutest fabrics!! Love love love. 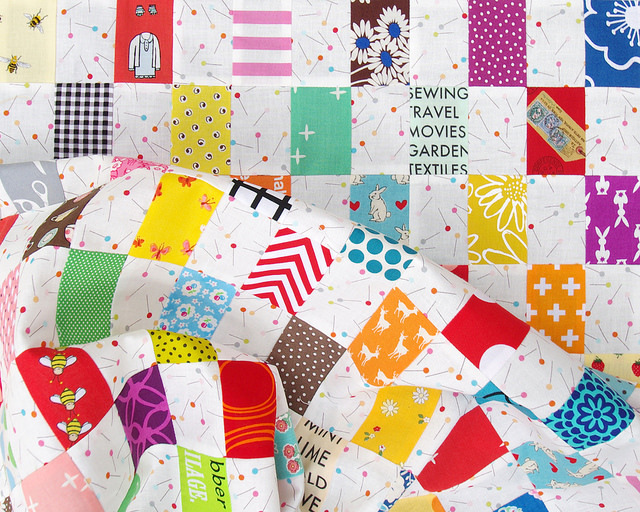 What a great bit of patchwork! I was just thinking about checkerboard today and rectangles never crossed my mind. I have the opposite problem in my stash - most things are saturated. 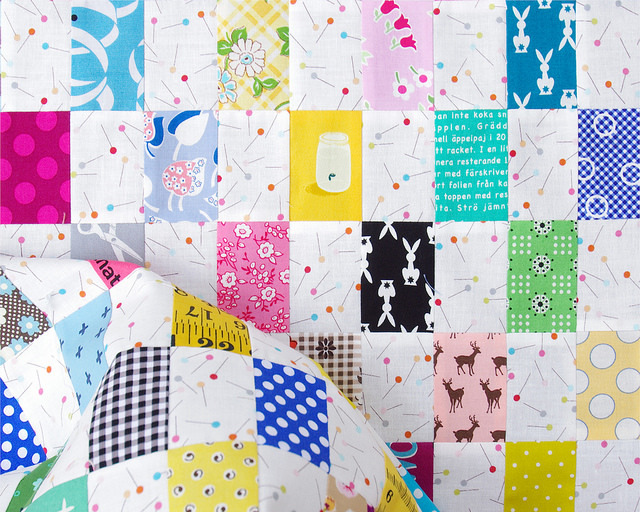 I am often drawn to your quilts with their pretty, lightness. Your work is always such a beautiful inspiration, thank you so much for sharing it with us! Well, I just had to look at all the postage stamps offered for sale in the U.S. right now. Less than half of them are squares. Rectangles rule! I love your use of color and have learned so much from you. This is so beautiful - a great combination of fabrics. I love the eyeglasses too.